Everyone in my house is a big fan of Mexican food. In fact my daughter could eat tacos every night if we would let her. But Mexican food isn’t just about tacos and quesadillas. There are so many different dishes that people should try. 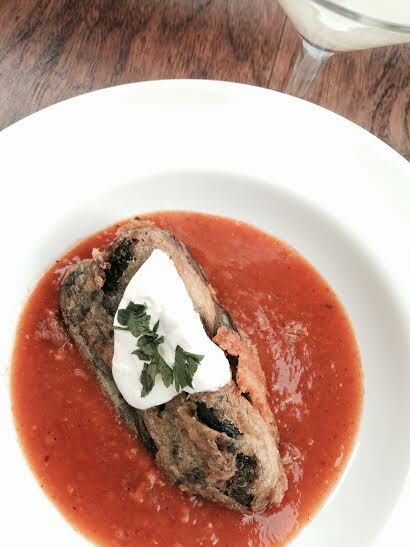 Chile rellenos is one of them. The poblano is a mild chile pepper with delicious flavor when charred. It’s traditionally stuffed with cheese but you can get creative and stuff it with whatever you may like. It’s a super easy dish for any night of the week. Give this a try and I promise you will fall in love. Do not rinse the peppers after removing skin. Using a knife make a slit on the side of the pepper length wise. Remove seeds and inner membrane. Repeat step with each pepper. Next add both cheeses to all of the peppers about 1/4 cup to each. Season with salt and pepper. Take a tooth pick and close the pepper making an X. This is to secure the filling so it doesn’t leak out while frying. Dredge the poblanos in flour and set aside. Mean while add the sofrito to a pot and heat. Once heated add to a shallow bowl. Top with poblano chile and source cream. Serve immediate and enjoy. I love mexican food but my repertoire is restricted to chilli, burritos and tacos. These look so good!